Delete an active folio from your dashboard. 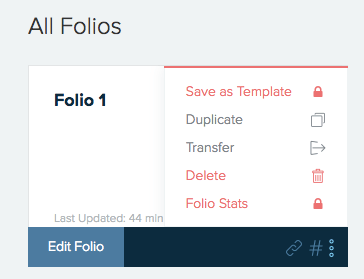 Recover an archived folio if you need to edit or share it again. Hover over the folio you want to delete and select the 3-dot ‘more’ menu. You can also select the 3-dot dropdown menu at the top right of the edit screen. Switch your dashboard view from ‘active folios’ to ‘delete folios’ via the dropdown at the top right. Learn more about managing your dashboard here.